"Surprised, aren't you? For us, doing something like that is a breeze." Anime Biography: The younger of two sisters that act as escorts to the Souryuu heir Leon, Charlene is a somewhat absent-minded woman who forms one third of Team Dreadnought. 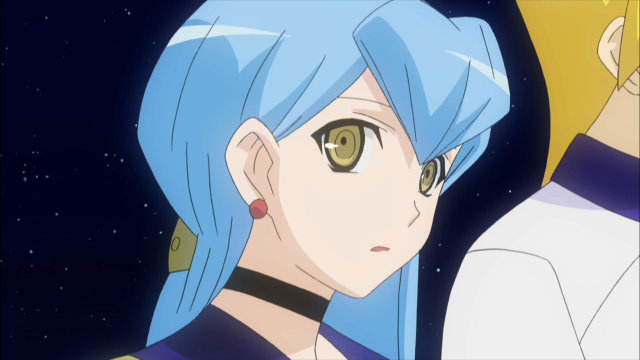 Skilled in both martial arts and cardfight, her role is to both protect Leon and act as his teammate in the VF Circuit's competitions. While on the surface she is the more passive of the sisters, Charlene becomes intense when angered, belying her outward appearance. Charlene makes her debut in rides 87-91, accompanying Gillian and Leon to Hong Kong in order to score points as part of Team Dreadnought. While nominally just another team seeking to qualify for the final stage in Japan and an international trophy, their real goal is the total revival of the Souryuu family that once ruled the seven seas with their naval might. In order to accomplish his goal, Leon continually calls on the "wind," PSY Qualia, which eventually guides him to step into the fray himself for the Hong Kong tagfight finals, with Charlene as his partner. Through them the finals are won, and the three then proceed on a flight into Japanese waters. Here they are accosted by Yahagi Kyou and his Avengers, who plot to replace Dreadnought in the Japan stage of the Circuit. However, Charlene and Gillian easily fend off their assailants, then leaving Leon to finish Kyou off in a cardfight. Charlene is speculated to be a member of the Souryuu family, due to her wielding the Aqua Force clan that according to Leon in ride 90 and outside rumors in 83, is supposed to be accessible only to them. There are multiple explanations for why her and her sister's surnames differ from Leon's--although the Souryuu people have allegedly dwindled to a single family, the size of the family is unstated, so there is a possibility that they come from a branch family and are Leon's distant cousins. Historically, when the political dominance of a particular, large family over one territory becomes important, the end result is a multiple lines of first, second, third and onward cousins growing increasingly distant from one another, each with their own children to hold strategically valuable offices and ensure that there will always be a legitimate heir to the family's central point of authority. Therefore, "Chen" may be but another branch in the Souryuu line, removed in some way from Leon's main family. Another explanation is that Charlene and Gillian come from a different house than Leon. In Japanese custom it is commonplace for children to take the names of the parents that they were raised by or the family that they were raised with, so in the event of a divorce or some other dividing of children, two groups of children born to the same parents would only have the surname of one parent and not the other. If this were the case, then Charlene and Gillian would be Leon's sisters, raised in the Chen house rather than the Souryuu house. Like all Dreadnought members, Charlene fights with an Aqua Force deck. Her particular build is Navalgazer-centric, as it lacks the unique Maelstrom cards of Leon's deck, and also unlike Leon it makes use of limit break support like Reliable Tactical Commander to trigger Navalgazer's skill early. Where Leon uses Algos to gain card advantage, Charlene instead relies on Valeria, using an inverse strategy that retires the opponent's rearguards instead of directly increasing her own scope of control.